Every girl needs to add accessories to her outfit! We have a gorgeous selection of necklaces that she will love to wear with her tutu outfit. Ballerina? owl, unicorn or a crown - there are lots of pretty options for adding to your tutu outfit! 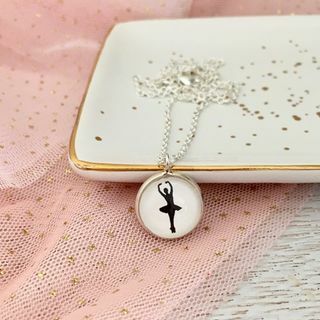 Here’s a necklace for those girls who dream of dancing. The simplicity of the black on white means it will match and compliment any tutu! The 12mm glass dome image is set into a silver plated pendant tray and comes with matching 18 inch fine link chain. Not suitable for children under 3 years. Looking for a little accessory that’s cute but not too girly? 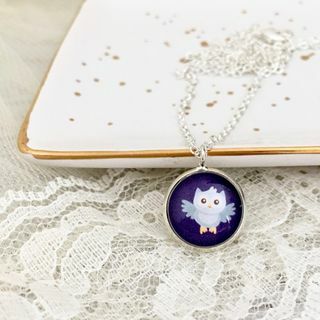 Then this charming light blue owl on a navy blue background may just be what you are after. 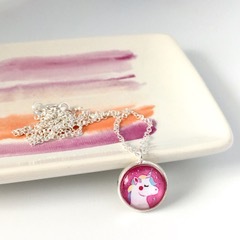 The 12mm glass dome image is set into a silver plated pendant tray and comes with matching 18 inch fine link chain. Not suitable for children under 3 years. Delightful and enchanting, this magical unicorn necklace is always a popular choice and is the perfect addition to pretty much any tutu! The 12mm glass dome image is set into a silver plated pendant tray and comes with matching 18 inch fine link chain. Not suitable for children under 3 years. 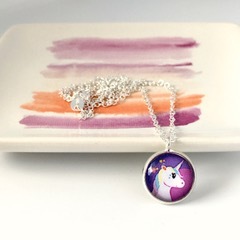 This elegant and sophisticated unicorn necklace is a perfect choice for the slightly older girls. It would look particularly stunning with the Purpilicious Tutu. The 12mm glass dome image is set into a silver plated pendant tray and comes with matching 18 inch fine link chain. Not suitable for children under 3 years. If you’ve chosen a tutu for a garden party or any outdoor event, then this is the necklace match! 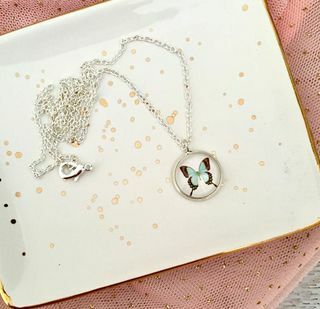 The pretty mint coloured butterfly sits on a white background making this an elegant and delightful accessory. The 12mm glass dome image is set into a silver plated pendant tray and comes with matching 18 inch fine link chain. Not suitable for children under 3 years. 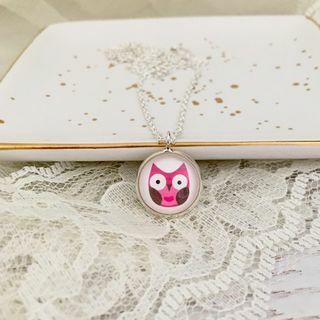 Cute enough to charm anyone, this necklace features an adorable little pink owl with big round eyes. Just perfect for the playful girl who likes to have a bit of fun. The 12mm glass dome image is set into a silver plated pendant tray and comes with matching 18 inch fine link chain. Not suitable for children under 3 years. Is your girl going to be a princess for the day? 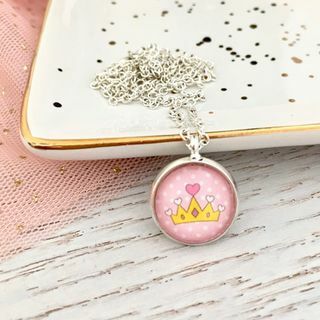 Then this sweet crown necklace is the perfect way to finish off her outfit. The 12mm glass dome image is set into a silver plated pendant tray and comes with matching 18 inch fine link chain. Not suitable for children under 3 years.